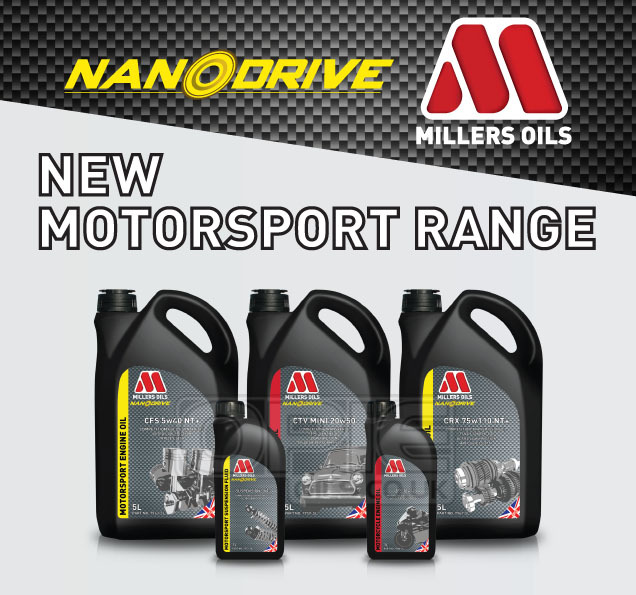 We expect the majority of you have heard of Millers Nanodrive Oils by now - They were a real game changer when they were first introduced to the world of motorsports, providing a dedicated range of oils that were designed to increase power by reducing friction, all thanks to their nifty "Nanodrive Additive Package"
Well, the tech guys at Millers Oils have done it again. They're improved on what was considered the peak of performance oils by ushering in a new and improved range for their motorsport category, and Opie Oils are pleased to announce that they are on the shelf and ready to go - just in time for the race season! Millers are driven by their obsession to produce highly innovative products which offer outstanding friction reducing properties. This is at the core of everything that they do. Due to an intense development programme, their new and improved range of next generation competition racing oils now incorporates their award winning NANODRIVE ultra low friction technology across the board. First off, we have the CSS and CFS range. Millers have significantly improved the capabilities of the already established CSS and CFS oils by incorporating a high performance, triple ester formulation, and then adding a measured amount of their unique NANODRIVE additive package. It's the addition of this little beauty that can effortlessly deliver up to 15% lower levels of friction than their predecessors. The entire CFS range is all fully synthetic and has benefitted massively by this addition of the NANODRIVE additive package, offering a further 26% reduction in friction than their predecessors. Simply put, you can expect significantly improved levels of performance on track and road, delivering great value and performance levels in an affordable package - these are designed to increase the performance of an engine in respect of improved HP and increased torque. Up next, we have Millers new flagship NANODRIVE NT+ Oils. They have completely redefined their criteria usually associated with a performance lubricant to bring an absolute top of the range product to those in the absolute top tiers and demands of motorsport. This range features their new and improved NANODRIVE NT+ ultra low friction package. If you thought their previous range of Nanodrive oils were great, and they couldn't possibly improve on them, this NT+ package is proven to reduce engine friction by a further 15% over and above this previous multi-award winning products - this sets the NT+ range apart from all others in this arena, providing immediately noticeable increased levels of power and torque as well as increased efficiency in your engine's performance. NEXT UP - TRANSMISSION OILS AND SUSPENSION FLUID! For vehicles with limited slip, have a look [url=http://www.opieoils.co.uk/c-970-limited-slip-diff.aspx#Filter=[ManufacturerID=164*ava=0]HERE[/url]. Millers have also had their first foray into adding their NANODRIVE NT+ technology into a broad range of suspension fluids. Thoroughly tested and offering excellent bump and rebound characteristics, proven to significantly contribute to an extremely smooth suspension operation. Ideal for those days on track! All in all, Millers have really put some work into their newest offerings for the world of motorsport, giving you peace of mind that you've got the best possible product in your vehicle, regardless of its level of modification or the type of use it is getting. You can view all of Millers products HERE, including their rebranded [url=http://www.opieoils.co.uk/c-450-brake-fluid-clutch-fluid.aspx#Filter=[ManufacturerID=164*ava=0]brake fluids[/url], [url=http://www.opieoils.co.uk/c-473-fuel-treatments-octane-boosters.aspx#Filter=[ManufacturerID=164*ava=0]fuel treatments[/url], competition running in oil and even their updated range of Motorbike Oils. Those of you with a classic vehicle tucked away may be interested in having a look at their updated Classic Range, which you can find [url=http://www.opieoils.co.uk/c-1249-classic-engine-oil.aspx#Filter=[ManufacturerID=164*ava=0]HERE[/url]. They've done a great job of creating top quality products that perform fantastically in classic vehicles and harnessed that vintage look with old school metal cans and label design. DON'T FORGET! ALL OF YOU GUYS GET A 10% DISCOUNT ON YOUR ORDER FOR BEING PART OF THE FORUM! You can usually find this discount code in signature. If you've got something a bit special and need a bit of advice, then give us a ring for a bespoke and impartial recommendation that is tailored to your specific set up. We're in the office Monday to Friday 8:30 - 5:30, on 01209 202 944 and sales@opieoils.co.uk. You can also drop us a message on here. That's about all for now, we'll be sure to let you know of anything else going on. Until next time, folks.